Discussion in 'Ad Campaigns' started by blackangel41999, Jul 13, 2009. WOW so diffrent from the last campaign!!! 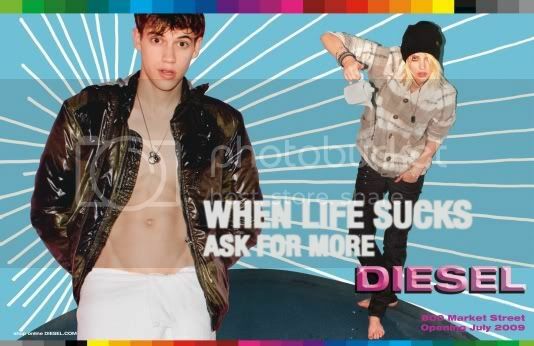 Great to see something fun and colourful for Diesel again. Thanks for posting. looks fun! are you sure its the actual campaign? Eeerrm... is this actually their F/W 09/10? Shure do hope not, yeesh. there's a big difference between fun and just plain silly. I somehow like the tagline. I don't like this at all, it looks cheap and such a downgrade from last season. The second shot does look slightly better than the first one though. if they really are going for the 90s look and trend, they get an A for effort and being the first (or one of?) but F for the result. There's a fold out ad in the new issue of Dazed and Confused. It looks like something an art student would do, trying to copy Bruce Weber. models are fine.. but just doesn't work out the colors.. too much eyes are concentrated on background, it's to bright and colorful . Are these Cartoon Network ads! The Fall lineup looks great!